1. 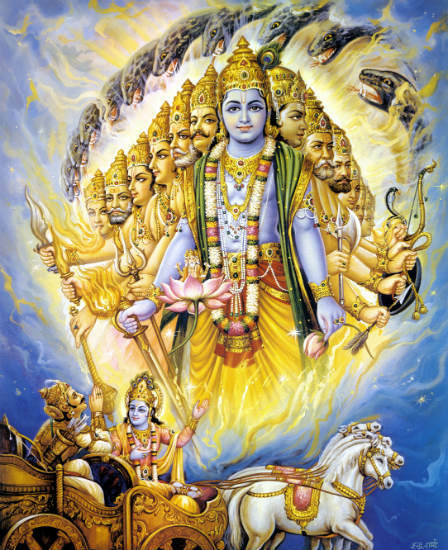 The Bhagavad Gita ( श्रीमद् भगवद् गीता ), is a 700-verse scripture that is part of the Hindu epic Mahabharata. This scripture contains a conversation between Pandava prince Arjuna and his guide Lord Krishna on a variety of theological and philosophical issues. 2. Faced with a fratricidal war, a despondent Arjuna turns to his charioteer Krishna for counsel on the battlefield. 3. Krishna, through the course of the Gita, imparts to Arjuna wisdom, the path to devotion, and the doctrine of selfless action. 4. The Gita upholds the essence and the theological tradition of the Upanishads. 5. However, unlike the rigorous monism of the Upanishads, the Bhagavad Gita also integrates dualism and theism. 6. The Bhagavad Gita's call for selfless action inspired many leaders of the Indian independence movement including Mohandas Karamchand Gandhi, who referred to the Gita as his "spiritual dictionary". 1. Bhagavad Gita comprises 18 chapters (section 25 to 42) in the Bhishma Parva of the epic Mahabharata and consists of 700 verses. 2. The verses themselves, using the range and style of Sanskrit Anustup meter (chhandas) with similes and metaphors, are written in a poetic form that is traditionally chanted. 3. Bhagavad Gita is classified as a Smṛiti text or "that which is remembered". Śruti texts, such as the Upanishads, are believed to be revelations of divine origin, whereas Smṛitis are authored recollections of tradition and are therefore fallible. 4. As a Smṛiti, the scriptural authority of the Gita is dependent on the Upanishads (Śruti). 5. Gita represent a summary of the Upanishadic teachings and is thus called "the Upanishad of the Upanishads". First 6 chapters are Karma Yoga section : Science of the individual consciousness attaining communion with the Ultimate Consciousness through actions. 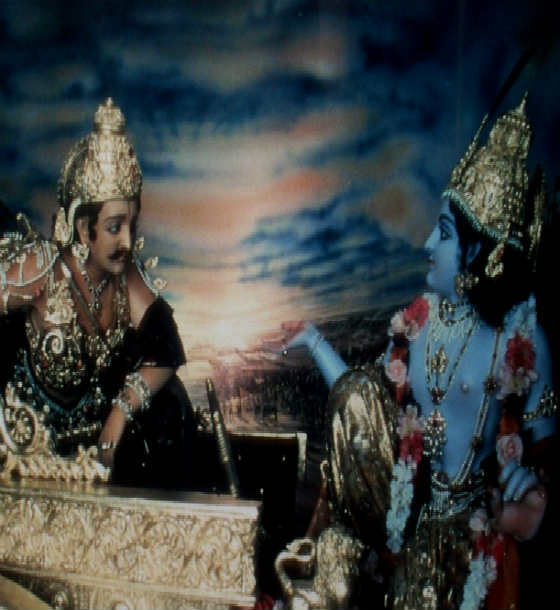 Arjuna has requested Krishna to move his chariot between the two armies. His growing dejection is described as he fears losing friends and relatives as a consequence of war. After asking Krishna for help, Arjuna is instructed into various subjects such as, Karma yoga, Jnana yoga, Sankhya yoga, Buddhi yoga and the immortal nature of the soul. 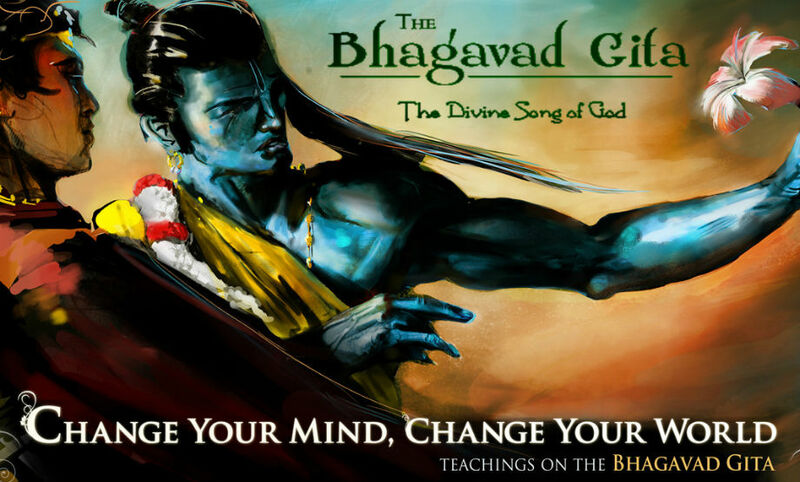 This chapter is often considered the summary of the entire Bhagavad Gita. Krishna explains how performance of prescribed duties, but without attachment to results, is the appropriate course of action for Arjuna. Krishna reveals that he has lived through many births, always teaching yoga for the protection of the pious and the destruction of the impious and stresses the importance of accepting a guru. Arjuna asks Krishna if it is better to forgo action or to act ("renunciation or discipline of action"). Krishna answers that both are ways to the same goal, but that acting in Karma yoga is superior. Krishna describes the Ashtanga yoga. He further elucidates the difficulties of the mind and the techniques by which mastery of the mind might be gained. Middle six chapters are Bhakti Yoga section : Science of the individual consciousness attaning communion with the Ultimate Consciousness by the path of devotion. Krishna describes the absolute reality and its illusory energy Maya. This chapter contains eschatology of the Bhagavad Gita. Importance of the last thought before death, differences between material and spiritual worlds, and light and dark paths that a soul takes after death are described. Krishna explains how His eternal energy pervades, creates, preserves, and destroys the entire universe. According to theologian Christopher Southgate, verses of this chapter of the Gita are panentheistic. Krishna is described as the ultimate cause of all material and spiritual existence. Arjuna accepts Krishna as the Supreme Being, quoting great sages who have also done so. On Arjuna's request, Krishna displays his "universal form" (Viśvarūpa), a theophany of a being facing every way and emitting the radiance of a thousand suns, containing all other beings and material in existence. 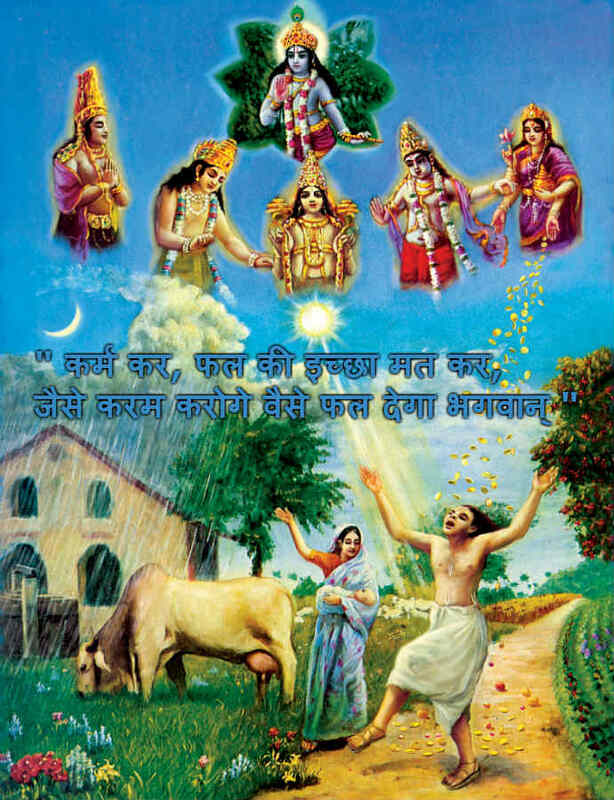 In this chapter Krishna glorifies the path of devotion to God. Krishna describes the process of devotional service (Bhakti yoga). He also explains different forms of spiritual disciplines. Final six chapters are Jnana Yoga section : Science of the individual consciousness attaining communion with the Ultimate Consciousness through the intellect. The difference between transient perishable physical body and the immutable eternal soul is described. The difference between individual consciousness and universal consciousness is also made clear. Krishna explains the three modes (gunas) of material nature pertaining to goodness, passion, and nescience. Their causes, characteristics, and influence on a living entity are also described. Krishna identifies the transcendental characteristics of God such as, omnipotence, omniscience, and omnipresence. Krishna also describes a symbolic tree (representing material existence), which has its roots in the heavens and its foliage on earth. Krishna explains that this tree should be felled with the "axe of detachment", after which one can go beyond to his supreme abode. 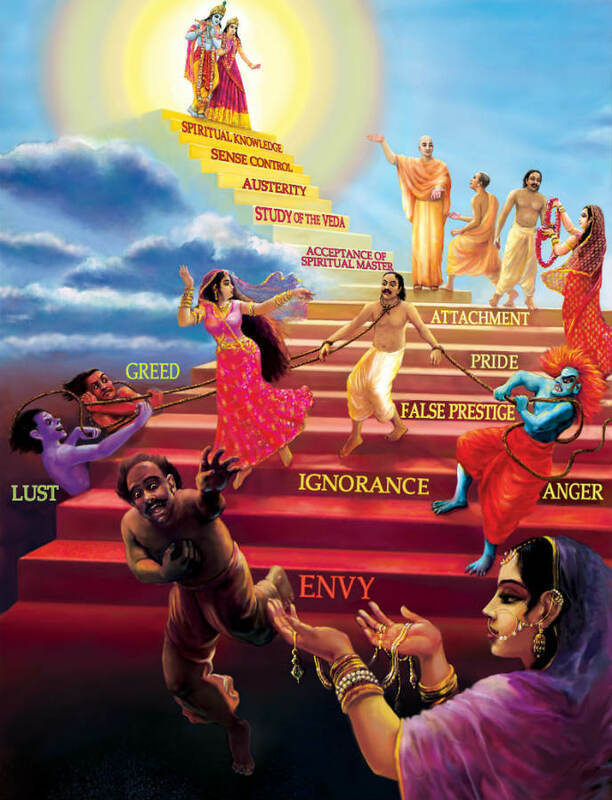 Krishna identifies the human traits of the divine and the demonic natures. He counsels that to attain the supreme destination one must give up lust, anger, greed, and discern between right and wrong action by discernment through Buddhi and evidence from the scriptures. Krishna qualifies the three divisions of faith, thoughts, deeds, and even eating habits corresponding to the three modes (gunas). 1. 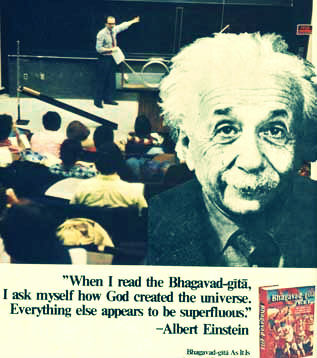 Albert Einstein stated that when reading the Bhagavad-Gita he thinks about how God created the universe and then everything else seemed so superfluous. 2. Mahatma Gandhi stated that the Bhagavad-Gita calls on humanity to dedicate mind, body and soul to purity. 3. Dr. Albert Schweizer stated that the Bhagavad-Gita has a profound influence on the spirit of mankind by its devotion to God which is manifested in all actions. 4. Sri Aurobindo stated the Bhagavad-Gita has a new message for every age and every civilization. 5. Herman Hesse stated that the wonder of the Bhagavad-Gita is its beautiful revelation of life's wisdom which has made philosophy blossom into religion. 6. Ramanuja has stated that the Bhagavad-Gita reveals the goal of the all the Vedic scriptures. 7. Aldous Huxley stated that the Bhagavad-Gita is the most comprhensive statement of perennial philosophy. 8. Madhvacarya has stated that the Bhagavad-Gita is apauruseya which means of divine origin and eternal. 10. Pandit Jawaharlal Nehru stated that "The Bhagavad-Gita deals essentially with the spiritual foundation of human existence. It is a call of action to meet the obligations and duties of life; yet keeping in view the spiritual nature and grander purpose of the universe."